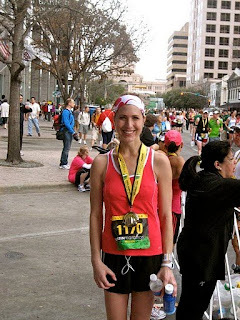 Amber Anderson, PT ran in the Austin Marathon with a final time of 3:39:56 placing 19th in her age group and 525 overall out of 4,796 finishers for the full marathon. This was Amber's first full marathon! Congratulations Amber! There were many negative comments regarding my “Do No Squats” blog. I wasn’t surprised because the exercise industry is very invested in that exercise form. One has only to read a copy of SHAPE magazine and see that about every 10 pages has a product to assist in doing squats or a program using squats as its staple exercise. Squats are an efficient way to strengthen the quads and gluteal muscles. Because they are the largest muscle masses in the body, exercising them results in more sweating, caloric expenditure and a great burn. But I honestly do believe that the world would be a better place without the squat as a form of exercise. I see patients in my office 3 full days a week and every week I will estimate that I see 4 people a day, therefore 12 people a week with injury related to doing squats, deep knee bends or lunges. If you extrapolate that number, minus a few weeks for vacation then you have about 600 people a year! I’ve been doing this for over a quarter of a century so I would say I’ve probably seen 15,000 patients with disease related to doing squats. Most of them are women but many are men. All ages are affected. I cannot think of another single activity which so consistently sends people to my office with complaints of pain in one specific place (the knee). There are other issues which are frequently associated with orthopedic problems. Motorcycles, for example, consistently injure people in an unfortunately predictable way, and obesity, which is associated with all sorts of lower extremity and bodily disease. I will also someday blog away on those two subjects as well. But right now, I’m addressing squats again because that blog made a lot of people very angry. Sure, squats can be done without caution by some people. Some healthy people. Who defines a “healthy person” before the deed is done. One could also say that healthy people can eat all the sugar they want or drink all the alcohol they want. But who preemptively defines a healthy person? Define the healthy knee before a person starts a squatting program. Who knows what a healthy knee alignment is…before the fact? Does that person have any patellar malalignment? Do they have chondromalacia patella already? Do they have a meniscus weakened by former injury, age or genetics? There are people who can probably do squats with abandon. Men are more likely to be able to do them without issue than women. Young men better than older men. A person with no existing crunching or grinding under their knee cap would be better at them! A thin person more so than a heavy person. These are very general categories and if a person came to me to ask if they could start a squatting program, I might be able to make a generalized prediction, but I could never give the recommendation because there would be liability for me in that recommendation. If one has to squat for a living, then one should be conditioned to squatting. But I have seen many plumbers, electricians, welders and computer repair specialists who must discontinue that line of work because of patellofemoral disease related to their squatting job description. And as for the comment regarding the need to strengthen the muscles in order to be able to get off and on the toilet…well, most of us have been adequately conditioning those muscles since we got out of diapers. But if one doesn’t have to squat to put food on the table, then one should proceed with a squatting exercise program with caution. Be aware of the presence of pain during and AFTER the exercises. Be aware of the development of crunching under the kneecap and swelling of the knee. Make sure you follow good instruction with regard to the positioning of your hip, knee, ankle and foot, and the depth of the squat. One comment suggested that doctors bug off with the prevention and stick to curing disease once it has manifested itself. Most doctors practice prevention every bit as much as the curing of disease and it’s the purpose of my blog. I want this information to go out to the public for the purpose of prevention as well as cure. In blogging about a controversial issue there is always the possibility that what I say might cause some readers to seek advice elsewhere. That’s a risk I must take. If more business was what doctors were all about, we would encourage squatting, motorcycle riding and overeating. Dr. Bergin was recently honored as Women of Influence in She! a supplemental magazine in the Westlake Picayune and Lake Travis View. The magazine focused on women of influence in the Austin area. According to the magazine, these are the ladies that do it all, make a difference and change the world. Women who are devoted, engaged and striving to make themselves and their communities better. Due to the possibility of snow, tonight's Arthritis Camp has been rescheduled to Tuesday, February 8th at 5 pm.